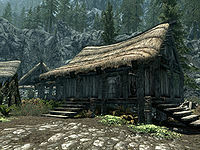 Lod's House is the home of Falkreath's blacksmith, Lod. It is almost always novice-locked and will require stealth for entry. It's made up of two rooms: a living area and a basement. It is found near the center of Falkreath, between Gray Pine Goods and Grave Concoctions. Speak to Lod: Help Barbas reunite with his master. There is a raised, covered porch along the length of the front of the house with steps leading up to it. 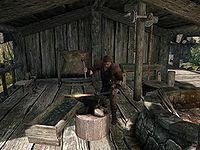 To the left of the house is a larger cover area where Lod plies his craft at his forge. There are also a grindstone, a tanning rack, and a workbench. There are two more tanning racks in front, not under cover. Beside these is an open crate containing four leather strips. Around the house there are four red and one purple mountain flower and a thistle. Unlike most merchants Lod doesn't display any of his wares. Upon entering there is a long wooden table on the left against the north wall. On the table is a sprig of snowberries, two chicken's eggs, several loaves of bread, a salmon steak, a cabbage, and two bottles of Nord mead. A basket on the floor to the right contains two leeks, with a set of shelves to the right of that. These hold two more leeks, a bulb of garlic, three potatoes, with two pine thrush eggs and several pieces of cheese on top and two garlic braids, three bunches of elves ear and a bunch of frost mirriam hanging above. There is a food barrel in the northeast corner, above the stairs leading down to the basement. The stairs run along the east wall. Opposite the table on the south wall is a fireplace with a cooking pot in front and a steel sword on the mantel. There is an iron shield on the hearth. To the left, hanging from the ceiling, is a rack holding three rabbits, and to the right is a wardrobe containing clothes. 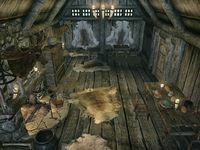 Next to the wardrobe is a round wooden table holding two bottles of Black-Briar mead, and a quest-related private letter is lying on the table next to his bed. In the southwestern corner and running along the west wall is a single owned bed, with an unlocked chest at the foot. To the right of the bed, against the west wall is a square wooden table and two chairs. On the table are five septims, an iron dagger, and a medium coin purse. In the basement, along the north wall are two long wooden tables. The first holds a hunting bow and three iron arrows, while the second has a bottle of wine, a bottle of alto wine, two bottles of Nord mead, an iron dagger, an iron sword, a set of iron armor and a pair of iron gauntlets, with a pair of iron boots underneath. To the left is an end table and chair. On top of the end table are two blacksmith's potions and a copy of the Smithing skill book Light Armor Forging. Against the west wall is an unlocked chest, a wardrobe containing more clothes, and a couple of food barrels. Along the south wall is a wooden block with a woodcutter's axe on top and a set of shelves holding nothing but clutter. To the left is a round wooden table and chair, with a loaf of bread on the table and a garlic braid, a bunch of elves ear and a bunch of frost mirriam hanging above. This is the merchandise found in Lod's Merchant Chest. The items are only available if purchased from the merchant; they cannot be pickpocketed or stolen. They are restocked every two days. You cannot make an investment with Lod through the Speech perk Investor.